Completed Portraits: British 19th C, British 19th C, except portraits, Dress and Textiles 74 comments Can anyone identify the sitter or the artist in this portrait of a bearded man wearing a red cloak? This is an unusual picture to be in our collection: little or nothing is known about it, not when it came into the Academy's collection (a volunteer is combing the RCA's minutes in the hope of discovering this), nor why the sitter is wearing such a 'theatrical' cloak, nor the date it was painted. All we can say is that it is oil on canvas, size 59 x 49 cm (sight), unsigned. Repairs to three tears on the front of the canvas, some retouching to the red cloak, restretching (but not relining) and revarnishing were carried out in 2008. 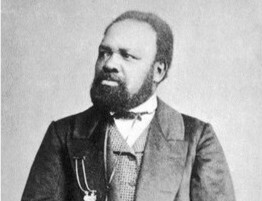 One suggestion is that the sitter might be posing as Othello – such as played by Ira Aldridge – and the face does slightly resemble a late photograph of that actor (in reverse). 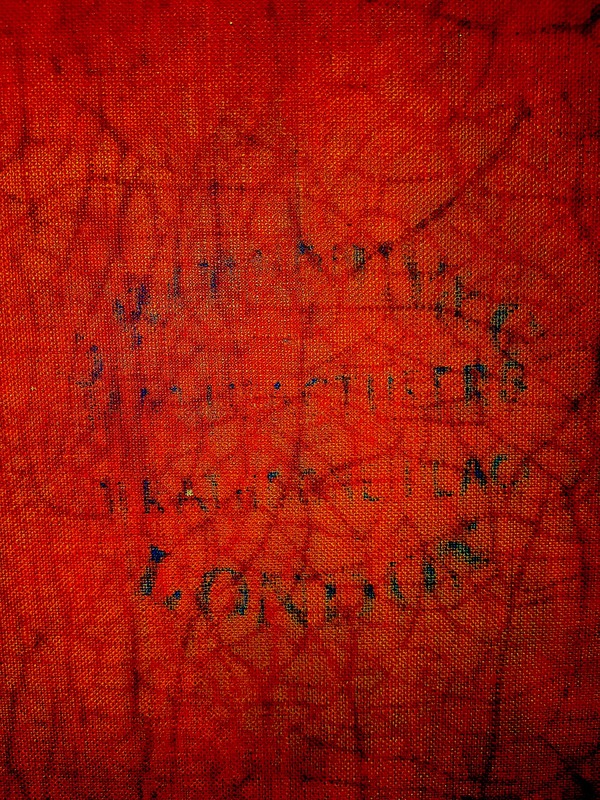 On the back of the canvas there is a fairly indecipherable maker’s stamp – I shall try a better or different light and submit any results – so far all we can make out is second line ‘Manufacturers’(? ), third line, something like ‘11 Rathbone Place’(? 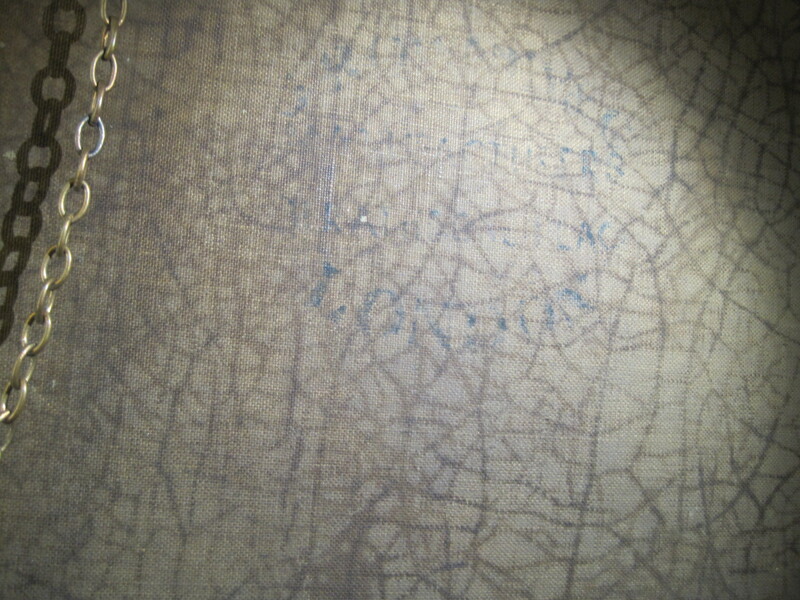 ), then 'London' on the bottom of the oval mark (mark is approx. 7.5 x 10 cm). This discussion is now closed. The newspaper reports make a very strong case for this painting to be identifiable as the 'Portrait of an African' by George Harrison (1840–1910), shown to the committee of the Canterbury Farmers Club in Feb 1862 and so probably datable to c.1861. Ira Aldridge! See later photos of him in a beard. Might almost have been painted from this photo, attached. What lies underneath the green background which is obscuring the right hand side of the face? The red cloak may even be obscuring contemporary clothes! Happy cleaning. Many thanks Lucy - yes, that suggestion has been made - and I have tried to upload photos of Aldridge to this site in support of our enquiry but they didn't get there (!). 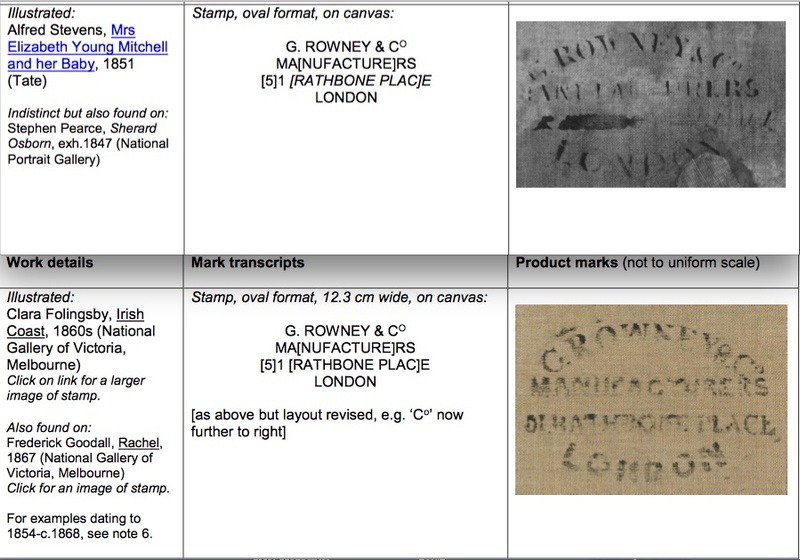 Also the stamp is now deciphered as G Rowney & Co of Rathbone Place....and seems to be from c1860s. Good morning, Royal Cambrian Academy of Art. I have just seen your second submission with the attachments. These are added now. Interesting portrait and if it is Aldridge, it could be quite important. Let's keep in mind Ira Aldridge's lifespan. According to the ODNB, he was probably born in 1807 and died in 1867. He was acting in London and the provinces from 1825 onward. But if the Rowney's label dates from the 1850s/60s, Aldridge would seemingly have been older than the man depicted here. Perhaps a detail of the Rowney label would help. Marion, would it be possible to upload clear images of the two labels, top left and top right, which are attached to the frame? Is there anything written on what appears to be paper labels on the top left and bottom right of the canvas itself? Excuse me if one of these is the maker's stamp, though that is normally printed on the canvas itself and I cannot see where it is. Kieran, the collection is following this discussion and should see your request very soon. I have tried enlarging the labels myself but the results are too blurred to be of any help. I am uploading details of the labels on the back of the stretcher - neither of which is helpful unfortunately - possibly the canvas and frame do not belong together, to judge by the top right hand one which seems to refer to a Welsh landscape subject. I am not sure what the other label refers to, not knowing (as yet) who donated the work to the RCA. The maker's stamp is on the canvas (upper centre - image attached), and is almost indiscernible at first sight - I tried to process an image of it on my laptop, and ended up with the 'red' image - clearest thing possible without specialist equipment. Did the whole of the label appear? I am not convinced this is Aldridge based on his photographs, and I tend to think it is someone else. For some reason this reminds me of Leighton, but that's hardly more than a vague impression. Here is a rather radical suggestion. Is there any possibility that the painting of "Old Bridge in Ffestiniog", as the top-right label reads, might have been painted over when this discussion's work was created? Could the bequest by "Gwyneth, North Wales" of her Ffestiniog painting to the "Picture Gallery at Plas Mawr, Conway" have been of the old bridge, but the quality of the work deemed it only suitable for destruction and overpainting by one of the subsequent members of the Royal Cambrian Academy of Art? 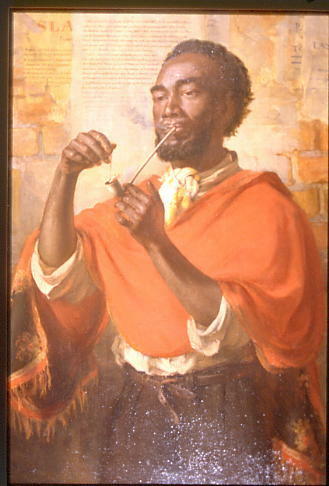 If there is that possibility, consider the other possibility that this might be a painting of the the 26-year-old Jamaican artist Carl Abrahams by Augustus John, executed some time around or after John met him between March and May 1937 in Jamaica and encouraged him to paint professionally. Augustus John was President of the Royal Cambrian Society at Plas Mawr from 1934 until 1939, and the Contemporary Arts Society of Wales was formed in 1937 under his term in office. He would have visited Jamaica half way through this presidency. John was known to have painted over or destroyed work of his own that he did not like. Perhaps he had no qualms overpainting the work of others in the same frustrated outbursts. It is a wild suggestion, no doubt, and through the simple analysis of brush strokes might be readily dismissed. Experts might consider, for instance, that the face in this discussion's work is painted too finely and does not have that loose and slightly impressionistic feel of many of John's portraits, even though there is something of the Orpen-esque and John-ian background of blocks of paint and energetic colour daubs to be seen here. I suppose I just do not feel that it is a work that comes from the 1860s. The above link with photographs suggests to me that this is Ira Aldridge. I note high forehead and shape of his ears. I'd suggest it might not be Othello but possibly Oroonoko (subtitled the Royal Slave) by Aphra Behn . It is known that Aldridge performed the part at the Royal Coburg Theatre (The Old Vic) in 1825 whilst in his late teens. Here is a painting from the Victorian & Albert collection of Ira Aldridge. There were a number of black actors working in London and the provinces in the mid part of the nineteenth century. Another was Samuel Morgan Smith. I have no substantive evidence that the Cambrian painting is of him. The match up with several of the Ira Aldridge looks convincing. Could this be a later copy of an earlier portrait? The red colouring of the cloak has a very fresh appearance for a portrait from his lifetime. Referring to the restorer's letter, it says 'most of the cloak has been overpainted to disguise craquelure' (ie on first inspection and before restoration) - but it also says 'the head is...untouched'. I agree with Kieran Owens that the date of this work may be different. 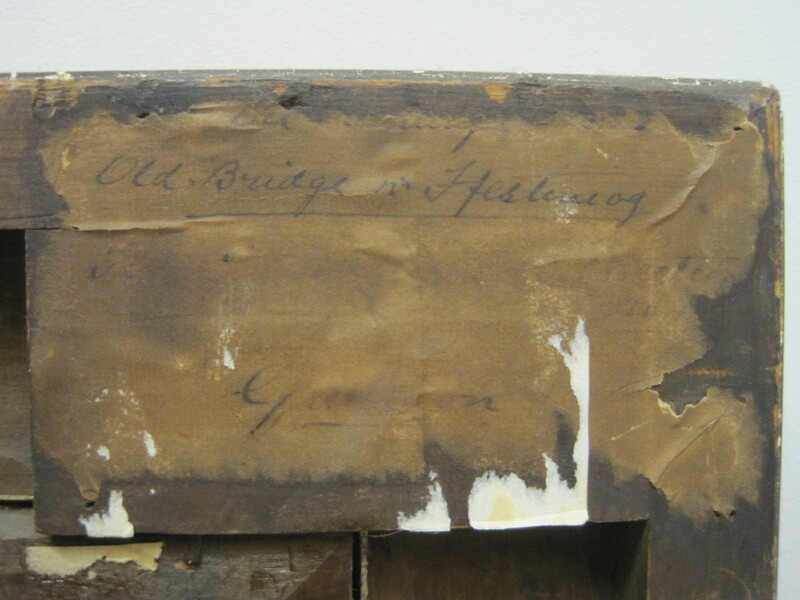 The label of the frame indicates that it used to frame “The old bridge at Ffestiniog” (here is a picture of that bridge that is 25 miles from the Royal Cambrian Academy of Art https://en.wikipedia.org/wiki/Llan_Ffestiniog#/media/File:Old_bridge_-_geograph.org.uk_-_353902.jpg ). So the frame, at least, has been recycled and the modern fixing attaching the painting to the frame suggest that this may not have been that long ago. The older labels on the frame and any date that they might indicate are thus probably a red herring, but the new label (by ‘Gwyneth’) may be that of the recent owner of this picture. And yet the frame is also a 'local' frame originally for the bridge, suggesting that the person who used an old frame for the current picture was local when it was reframed. The sharp colours, green, red and yellow/gold of the man’s costume and background are those of Ethiopia/Abyssinia. This is very unlikely to be coincidental given the powerful use of these colours (and the golden frame). Moreover, the cloak style echoes (or is) ‘Abyssinian’ too. Augustus John was part of the London circle (e.g. of Nancy Cunard) that struggled against racism and supported the Abyssinian cause against Italy in the 1930s. And the Ras Tafari movement, named after the Ethiopian emperor, Haile Selassie, emerged in Jamaica as a movement also in the 1930s also when Augustus John visited there. (Epstein had sculpted Selassie) So I wonder if one should look for Ethiopian connection is some way? I wonder, too, about "Gwyneth, North Wales” and whether she might actually be "Gwyneth Johnstone”, the daughter of Augustus John who died as recently as 2010? Maybe this is a much more recent acquisition? Note how this Gwyneth does not sign herself as of a town or village, which would be more usual, but of a region of a country, perhaps alluding to more to her ancestral connection there than to her (Norfolk) address at the time. I love wild theories, but as an Augustus John mega-nerd, I have to regrettably throw cold water on it. This isn't a John. Brrrrrrr. That was cold! Onwards. I now completely agree that the label directs that the painting should go to the "Picture Gallery, Plas Mawr, Conway, Gwyneth, North Wales". The address appears to be written in biro, so must be a relatively recent accession, possibly post-1940s. That trawl of the records might reveal from whom it came. Kieran, your very left field suggestion was much appreciated. And we have now established that the frame belonged to a different picture. It would be interesting if the donor of the recently written (20C), in biro, instructions about the donation could be identified. Marion or Royal Cambrian , once again I wonder if there anything written on what appear to be paper labels on the top left and bottom right, not of the frame, but of the canvas itself? 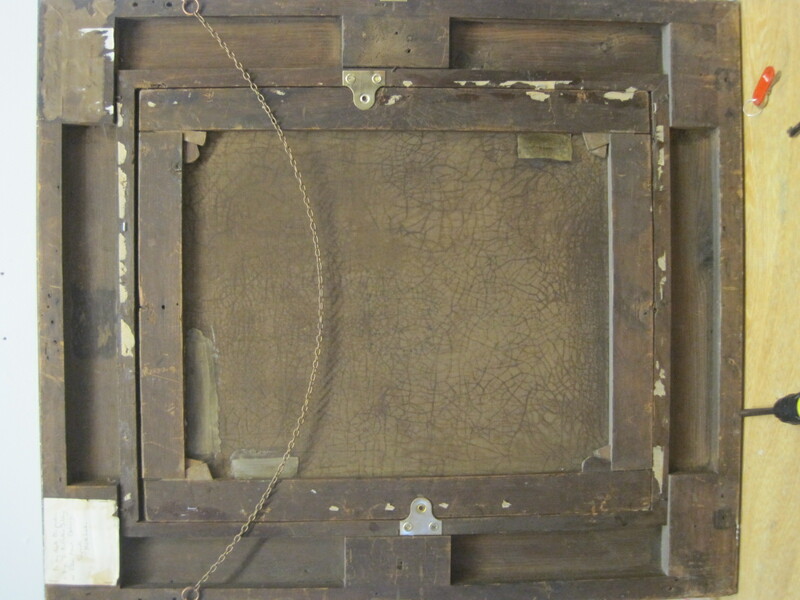 Sorry - the 'labels' are not labels but conservator's patches / reinforcements where there were tears in the canvas. We shall take the picture down again soon and get it out of the frame this time, to see if there's anything else that might help. Thank you Liz - I have already alerted Marian via Facebook but would be glad of any additional ideas and contacts. When you do take the picture out of the frame, do look at the edges of the painting for any possible signs of overpainting. Could it be Emperor of Ethiopia, Haile Selassie (1892 -1975)? Haile Selassie, as Emperor of Abyssinia (as it then was), spent a fortnight in Penlle'rgaer, outside Swansea, in 1939 when he was exiled from his country by Benito Mussolini. Although over 150 miles from Plas Mawr, the painting does not have to have had an association with that latter place, and could have originated anywhere. The specific postal detail of the "Gwyneth" label on this painting suggests that it was being donated from outside the Conway region. Given that the canvas stamp on this picture matches one closely from 1847, and in the absence of information that this has been painted over, then I think we should not reject too hastily those who consider this to be a portrait of Ira Aldridge. 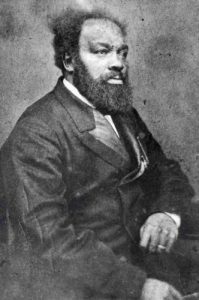 He often played in Wales (in Swansea, but also perhaps elsewhere), and was certainly in Swansea for 10 nights in 1849, playing Othello and Mungo (Theatrical Journal London Vol. 10, Iss. 508, (Sep 1849): 281-281.). Aldridge also used to wear a heavy red cloak when playing Othello in his younger years. https://www.tate.org.uk/art/artworks/simpson-head-of-a-man-ira-frederick-aldridge-n00382 . I have manipulated, slightly, the image that Lucy Fisher sent using a 3D programme to turn the head slightly on the photo to match the portrait pose. If one accepts that the photograph will date from a later time in Adridge’s life, a decade or more later than the portrait (and so has lost some hair, perhaps gained some weight and has slightly baggier eyes), then this match seems very good to me (eyebrows, eyes, nose match well - though I must admit that on past record I don't seem to be very good picture comparison!). Does the Royal Cambrian Academy of Art have a pre-2008-restoration photographic image of this painting? It would be interesting to see exactly what state is was in and how much of the work was actually retouched. It would indeed be interesting to see such a photographic record - unhappily we do not have such an image, but I will contact the restorer to check if she has anything - thanks for the prompt Kieran. I mentioned John Simpson's 'The Captive Slave' of 1827 long back in this discussion but without seeing the relatively recent comments on it by the Art Institute of Chicago (which bought it in 2008)citing the model as Ira Aldridge. The pose is different and there's atonal difference in the orange of the dress (which in that in question could be 'costume') but if the Chicago picture is indeed based on Aldridge, then ours might be too: its not a case of one being more like than the other - either could be, or not, but they would have to be of at least about the same date which is certain for the 'Captive Slave'. Could ours be Simpson though not quite as polished as he usually is? The orange colour is interesting in itself now we have three examples in this discussion, allowing the 'Pipe of Freedom' is a different man: is it just that it goes well with black skin colour (a Titianesque tone, at least for period if one thinks of 'Othello' and its Venetian setting), or is there some other significance? Apologies for the delay.....I have still not been in touch with the conservator, but can update the discussion participants with the following. Our indefatigible volunteer archivist Bob Shires RCA discovered a letter (and response from the RCA) relating to the bequest of paintings, including: 'Portrait ? Abyssinian?' by one of our members, George Harrison. The letter is dated 1992 and implies that Harrison is the artist but that the subject title, inspiration or name of the sitter is not known. The correspondence is from F. H. Roberts, grandson of the artist, on behalf of his deceased sister Kathleen H. Roberts who left the works to the RCA. Harrison arrived in Conwy from Kent in 1860, married a local girl in 1863, and became a founder member of the RCA in the 1880s. Information on him relating to his early work is scarce but we are digging. 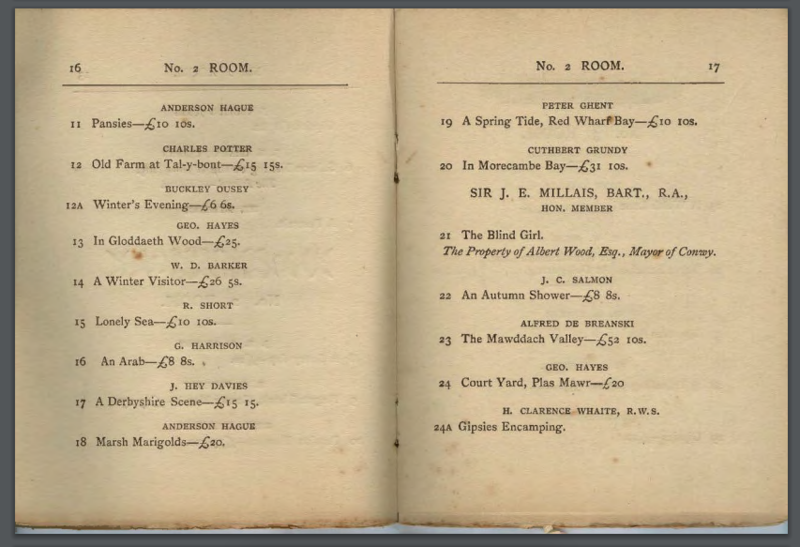 I am adding a further bit of information Bob Shires has turned up: a page from the 1887 RCA Plas Mawr Summer Exhibition (see attached) including an entry for Geo Harrison, portrait of an 'Arab' - hardly more enlightening than an 'Abyssinian' I'm afraid. If the letters that the RCA has now unearthed support the suggestion that this portrait is by George Harrison, it is highly unlikely that this is a depiction of Ira Aldridge, especially if Aldridge's appearances in Wales fell mainly at the end of the 1840s and beginning of the 1850s, as James Fairhead documents above. George Harrison was born in Canterbury, Kent, where he was baptised on the 28th January 1840, the son of George and Eleanor Harrison. He would only have be about ten years old when Aldridge was appearing in Wales. Harrison is well documented as having moved to Wales in his early twenties and it was in the district Llanrwst on the borders of Denbighshire and Caernarfonshire, in or just before December 1863, that he married Catherine Hughes. The 1871 Welsh census shows them as living at Ty Gwyn in Llanrwst, Denbighshire, he an artist aged 31 and she aged 29. In the 1881 Census they are still at Ty Gwyn, he self-described as a Landscape Painter, aged 41, she his wife aged 39. By now, they also have two daughters, Eleanor, aged 7, and Catherine Elizabeth, aged 4. Still at the same address in 1891, he, again self-described a Landscape Painter, aged 51, and she aged 49, are now living with two daughters, Catherine Elizabeth, aged 14, and Jane Winifred, aged 8. The 1901 shows the couple (he, still a Landscape Painter, aged 61; she, aged 59), along with Catherine Eliza, now aged 24, and Jane Winifred, aged 18. The second of the two daughters, Jane Winifred, who was born in 1882, was married to Griffith William Roberts (b. 28th February 1883) in early 1909. Their first-born child was Kathleen Holland Roberts, who was born on the 16th November 1909. She died on the 17th November 1992, at 28, Westbury Avenue, Pondtail, Fleet, Hampshire. All of this goes to show that Kathleen Holland Roberts, as granddaughter of George Harrison, must have been the bequeather of this painting to the RCA in 1992. It would now be deeply helpful if the RCA could send ArtUK a copy of both the letter of bequest and the RCA's response, which might allow for a more detailed interpretation of her intentions and of the description of the painting contained therein. 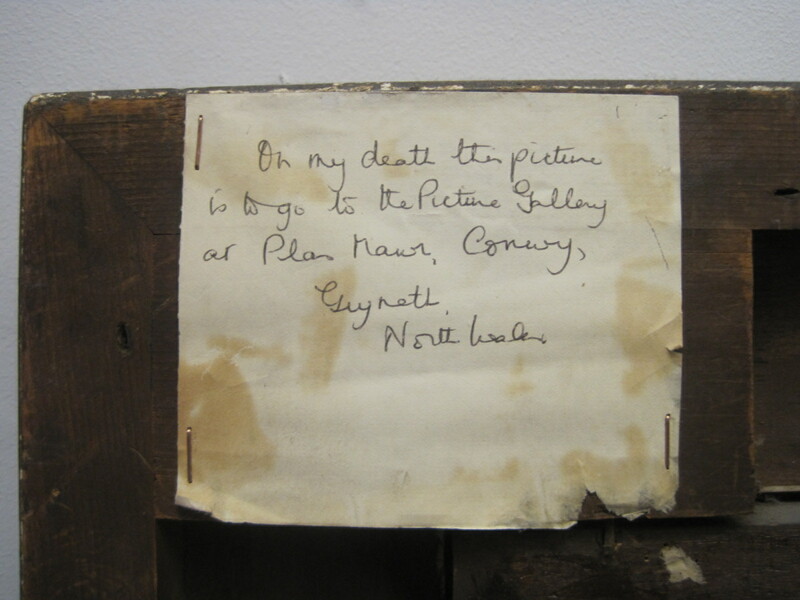 It must also be likely that it is her biro instruction on the painting's frame that instructs that the work should be sent (from presumably Pondtail, Fleet) to the RCA at Plas Mawr, Conway. Additionally, it is approximately 13 miles from Llanrwst to Conway. The Liverpool Mercury, of Saturday 18 June 1887, reports that in the RCA exhibition of 1887 one of "the only pictures yet sold (is) 'The Arab' by George Harrison." Would the granddaughter of the artist still have it in the family's possession if it had been sold? One way or the other, it shows that Harrison painted more than landscapes, though it is not clear if the subject was a human or a horse. Many thanks Kieran - We must look through the catalogues to see whether Harrison exhibited anything other than landscapes, ie other portraits - or horses even. Harrison's home Ty Gwyn was not at Llanrwst but on the outskirts of Betws-y-Coed as far as we know - where the Ty Gwyn Hotel is now by the Waterloo Bridge. Would Llanrwst in the census indicate the district within the county of Denbighshire? Bangor Chronicle does report on the 1887 RCA exhibition but no specific mention of Harrison's picture. Artists or their descendants have been known to buy back their own works.I shall upload the letter / bequest note as soon as I can. RCA correspondence - Harrison pictures - Copies of copies so hope these are good enough to read. Many thanks RCA for posting these. However, for the few weeks that the UK is still a member of the European Union, you might need to be cautions of any responsibilities that you might be under due to GDPR rules. My suggestion was sent more to allow Marion extract a more exacting interpretation from the letters. I am just being careful on all our behalves. When it comes to who the sitter is, we know that the canvas dates c. 1847-50, so it may well be earlier in Harrison's life (unless the portrait is painted on a recycled canvas..). Ira Aldridge did continue playing into the 1860s too. 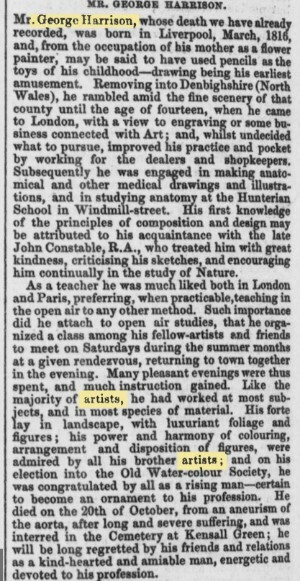 The last time that I can trace him in a show at Cardiff is November 1859 (The Era, Sunday November 20 1859), but he was on a tour in 1864 that took him to Dublin and there may have been shows in Cardiff then perhaps, too (though I doubt it). So it may still be conceivable, just, that this is a portrait by Harrison from life of Aldridge (and not all portraits painted are from life). There a second George Harrison associated with Denbighshire born 1816, died 1847, whose obituary I attach to avoid any confusion. There was also another African American actor, a (‘coloured Tragedian’) also playing the same parts, Samuel Morgan Smith, who was playing the Theatre Royal at Cardiff in March 1867, but he looked nothing like this portrait. Peter Lord, in his 'Imagining The Nation' (2000), writes that "George Harrison, who had arrived as a young romantic from Kent and married the blacksmith's daughter, lived at Ty Gwyn by Waterloo Bridge." George and his wife must have moved the two or so miles across the Conwy river and up the road from Ty Gwyn to Min Afon sometime between 1891 and 1901. Although described in the 1861 Census as a student at the Royal Academy, Harrison appears never to have submitted any works to their annual exhibition. Re Pieter's comment: 'Given that Art UK shows only one landscape by Harrison (1862-1908),at the Royal Cambrian, this may be hard to substantiate: oddly, he also does not come up on the artist name search....(?)'. Search for George Harrison (1862-1908) under 'Artists' and you will see '1 artist', but underneath his name it reads'4 artworks'. If you click on this, you can see all four. Marion, the Civil Registration Death Index for Wales shows that George Harrison's passing was registered in the district of Llanrwst, Denbighshire, in June of 1910, aged 70. It might be worth considering changing Harrison's date range on the ArtUK artist's database from (1862 - 1908) to (1840 - 1910). "A VETRAN ARTIST - DEATH OF MR. GEORGE HARRISON, R.C.A. It is with deep regret that we announce the death of Mr. George Harrison, R.C.A., of Min Afon, Bettws-y-Coed, which occurred on Thursday last, in his 71st year. Mr. Harrison had not been in the enjoyment of robust health for some time, but up to his last hour he was actively engaged in the pursuit of the calling which he so much loved, and on the morning of his demise he painted a beautiful picture of the kind for which he was so noted, the most remarkable feature of which is the striking accuracy of the colours, distinctly revealing his great power in that direction. Having completed this, he took a walk in the garden, and whilst there he complained of feeling unwell. He was taken to bed. Serious symptoms quickly developed, and he passed away as previously stated. He came to Bettws-y-Coed about fiftv vears ago from Canterbury, Kent. He had not been here long before he was married to Miss Hughes, Llugwy Cottage, and has ever since remained in the district. Mr. Harrison was an artist of repute, and was widely known throughout the country, being held in the highest esteem by everyone. He was the first elected member of the Royal Cambrian Academy, Plas Mawr, twenty-eight years ago, his connection with which was not severed to the last. He leaves a widow and three daughters, with whom the greatest sympathy is felt. The funeral took place at the Parish Church yard on Saturday, and was largely attended. The service was conducted by the Revs. R. M. Jones, M.A. (Vicar), and J. L1. Richards (Vicar of Dolwyddelen). Amongst the mourners were a large number of relatives and friends, including many members of the Royal Cambrian Academy. Representing the Academy were Messrs. T. Clough, T. Ellison, B. Fowler, R. Gay Somerset, W. J. Corah, W. J. Slater (Hon, Secretary), and J. R. Furness (Curator). Mr. J. Pain Davies was unable to be present, but was represented. The attendance included Mrs. Fowler, Mrs. Joseph Knight, and Mrs. Corah. Carriages were sent by Mrs. Roberts, Voelas Hotel; Mrs. McCulloch, Waterloo Hotel; Mrs. Evans, Glan Aber the Misses Pullan, Royal Oak. There were a large number of handsome floral tributes." Thank you, Kieran. I have changed the artist record to George Harrison (1840–1910). Marion, although I suggested that under GDPR rules the full contents of the Harrison family letters might be best un-posted on the ArtUK website, certainly until such a time as the family might allow them to be so presented, it would be greatly appreciated if an extract by you or by the RCA from the letters, wherein it states something to the effect that "some" of the works are by George Harrison, could be posted, along with the specific list of the bequeathed works. F. H. Roberts wrote to the RCA on 9 June 1998 to inform them that a relative had been unable to view Harrison’s paintings when she visited the RCA and that their whereabouts were unknown. A receipt for the paintings was enclosed. The curator, Vicky Macdonald, responded on 10 June 1998 that she would bring Roberts’ concerns to the attention of the RCA Council at their next meeting. She explained that the RCA had moved from Plas Mawr and that it held no permanent collection, only temporary exhibitions. Judging by the composition and approach taken when painting this piece I wonder if it is a study from his time at the Royal Academy of Art. It was a part of his portfolio which was in his possession was painted as early as the beginning of 1862 when he was approx 21. It was shown as an example of his work, along with a portrait of his father to prospective clients in 1862. 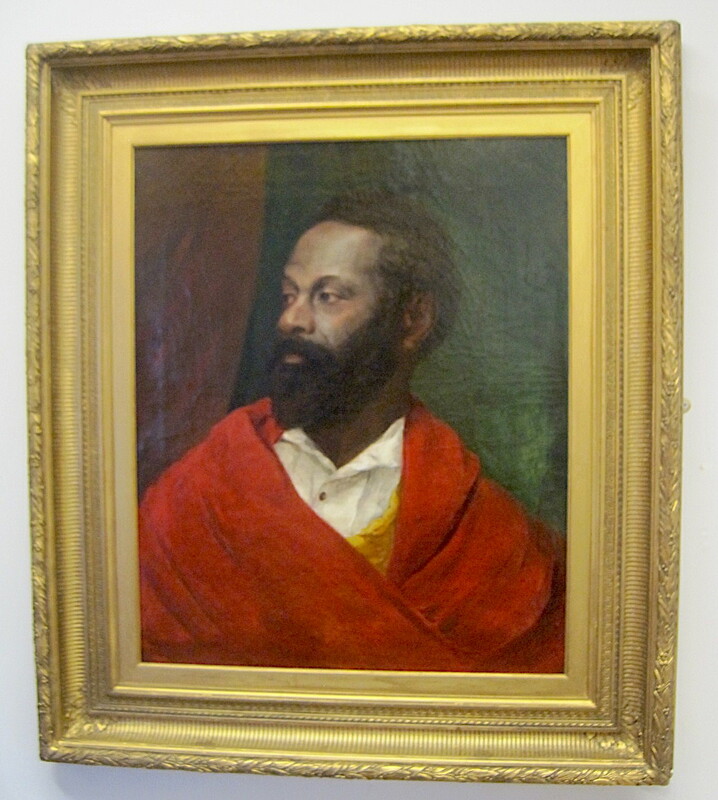 A 'Portrait of an African man, painted from life' was mentioned in various Newspaper articles from 1862 when he was hoping to be commissioned by the East Kent Farmers Club to paint it's Chairman and it appears that he had painted a total of at least three portraits in 1862. Two of these to be kept in the Clubhouse. It does look like The East Kent Farmers Club/Canterbury Farmers' Club still exist but it does appear that they currently meet in a Golfclub. It is one of the oldest Farmers' Clubs in the country dating back to 1793. There is also a book called “The Farmers at the Fountain” by Richard Fuller that records of the history of the club. There may be a source of information with regards to the current location if known of some of these examples of George Harrison's work (for comparison) under the contact us section of the following website. Once he was living in North Wales, I expect that landscapes rather than portraits of the surrounding area would have been a far easier to sell, as there was an emerging tourism trade in that area at that time. The formatting of the above attachment seems to have gone very strangely haywire. All the information is there but not necessarily in the order originally written. I'll post again if needed. Super find, E. Jones. Well done. And the 1862 date fits in nicely with the suggested date of the Rowney & Co of Rathbone Place stamp. It could well be that Harrison bought it in London while attending classes at the Royal Academy, which would have been a ten minute walk away door-to-door. And at some point in its history, this student canvas could have been fitted in to the unrelated "Old Bridge in Ffestiniog" frame. To add to E. Jones' excellent finds, an additional newspaper cutting, from the Kentish Gazette of Tuesday 18th February 1862, is attached. Therein is the mention of one of George Harrison's portraits as being of "An Arab Chief, in the dress of his tribe." Could this be the same painting that was sold at the RCA exhibition in 1887, the catalogue entry for which is attached above? I have posted this discussion link on the Canterbury Farmers Club Contact page with a note asking them to signal, preferably to Marion at Art UK, whether they still have the Neame and Mount portraits and if images might be available -or to join the discussion direct. If someone else has already done so I'm sure they'll note the interest. Brilliant finds by the way: they clearly knock out Ira Aldridge, Simpson etc. 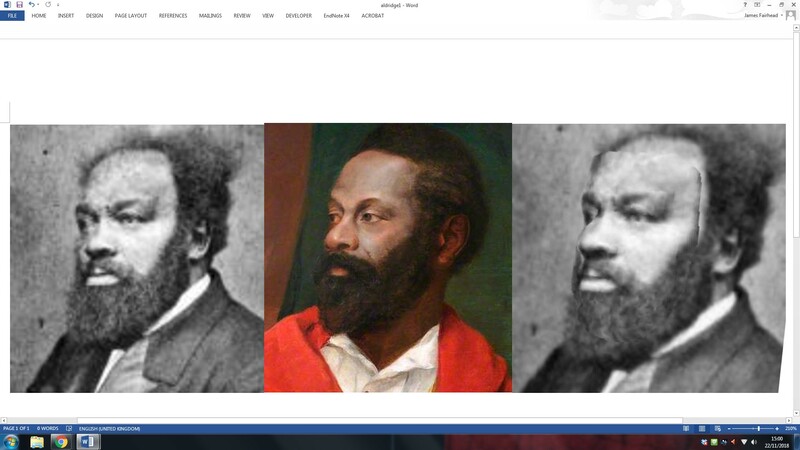 and -given Harrison's student status - suggests the man shown possibly earned money as an artists'/Academy model , though I'm still curious about why three black portraits (Simpson's, Smith's and Harrison's) all show men in practically the same orange dress colour. Let me add my thanks to you, E Jones. I'm convinced that you are right and this is 'A portrait of an African' c.1861 by George Harrison (1840-1910). The documentation on the artist is cast iron. That the artist, known for his landscapes also painted a portrait of an African from life is counter-intuitive, yet you have cast iron documentation. Amazing. I am not surprised that it impressed his audience. There was an exhibition (and catalogue) from 2005-6 in Manchester called “Black Victorians: Black People in British Art 1800-1900,” and this work would have stood very well within it, and it offers respectful portraiture not unlike those of ‘an African’ by Mostaert and Durer, or Gainsbororgh. Yet I wonder whether we can still find out who it is, and give a name to this sitter and get closer to the person and to their life in – or passing through - London? This image was painted on the eve, or during the American Civil War, and there was enormous respect and support in many circles for the anti-slavery cause, and this respectful picture speaks of that, not of colonialism or orientalism. So it remains quite possible that this is a portrait not only of “An African” but of a well-known African American involved in the cause, or even of an African American Liberian such as Alexander Crummell (who was in London in 1862). "George Harrison was enrolled as a student of the Royal Academy Schools on 18th Dec 1858 when he was aged 19. His address was 5 Grove Place, Camberwell Grove. He could have remained as a student in the schools for 7 years but we have no record of when he stopped attending. Sadly, we have no archival records directly relating to his time here. We do have cash books for much of the 19th century that name models used in the RA Schools. I have looked through the period that Harrison was a student here......... These cashbooks only give a surname and indicate if the model was a woman. There is no description beyond that." Further, unless the repairs and retouching to the red cloak, as mentioned in the introductory comment to this discussion, obliterated some traditional design or styling elements, this portrait hardly qualifies as a depiction that includes the "dress of his tribe" of an Arab chief in 1860. Our sitter's white buttoned shirt has more of a European or Western feel to it, and it is more likely that an Arab chief, attired in the dress of his tribe in 1860, would have had his head covered. The sitter has much more of an east or central African look about him, as opposed to the more middle-eastern features of an African from Ethopia, Eritrea, Sudan or Egypt. It could be, however, that Harrison painted a series of portraits or studies of sitters from a variety of ethnic backgrounds, including the "Arab Chief" and this discussion's gentleman. If this is a reasonable suggestion, it could be that the family were not the ones who bought the Arab portrait, the sale-at-exhibition of which is referred to in an above-attached newspaper extract. Is there more to do here? 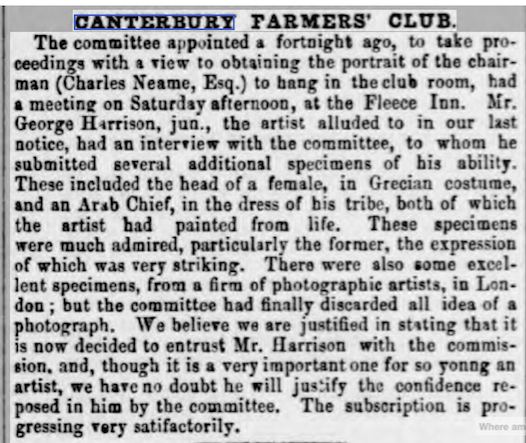 Despite lack of response from the Canterbury Farmers Club about their Harrison portraits, he has been established beyond resonable doubt as the artist, his dates and movements confirmed, the date of the picture as c. 1860-61, the sitter as possibly a now-unidentifiable RA model (or if not at least unlikely to be identifiable). It is also fairly clear how the canvas reached the RCA. Although a little late, can I just say a little thanks for some lovely comments in the feed, really kind. Thank you very much. The newspaper reports found by E. Jones make a very strong case for this painting to be identifiable as the 'Portrait of an African' by George Harrison (1840-1910), shown to the committee of the Canterbury Farmers Club in Feb 1862 and so probably datable to c.1861. I am happy to formally recommend this. Given the current exhibition in Paris where galleries have gone out of their way find who models were and to rename major pictures after them, would the Royal Academy not seek to pursue research on who their models were with a bit more umpf? It may not be an RA model of course, so research into Harrison may be necessary. This is a good picture, and it would be made vastly better in recalling the life of its sitter.... It may be quite a research task though.